Meteorological winter begins on Tuesday, December 1st; although, it will feel more like late autumn as we progress into early December. The November / December couplet is likely to be one of the warmer Nov-Dec periods in recent years/decades, due to numerous reasons, most of which pertain to the behavior of this ENSO event. Over the course of November, the development of a coherent / amplified MJO wave – quite a rarity for an El Nino of this magnitude – which propagated through phases 2/3, contributed to the forcing of a La Nina-like extra-tropical regime for much of the month. Specifically, the dominant NPAC signal was an anomalous mid level ridge south of Alaska – the polar opposite of the ‘typical’ Nino pattern – and its concomitant downstream trough over British Columbia. These features aided in inducing widespread warmth across the Mid-west / Northeast for the month of November. This will be one of the warmest Novembers on record, and for some locations, one of the warmest / warmest Sept-Nov autumns on record. The transition into December will feature a pattern that continues to be conducive for anomalous warmth across the Mid-west/East due to a reversion to the classic El Nino-associated Gulf of Alaska trough pattern. Thus, we are experiencing a ‘perfect storm’ of ingredients for the blowtorch Nov/Dec resultant pattern. November was Nina-like, similar to November 2009, and December should be similar to the strong el Nino climatology, as seen most notably in years like 1986, 1957, 1982, and 1940. The MJO wave has finally weakened / de-amplified and is progged to entered the ‘circle of death’ [or remain in a highly de-amplified state such that its effects upon the extra-tropical pattern will be minimal]. Consequently, the ENSO induced forcing will be the predominant mechanism by which the tropics impact the mid-latitude pattern over the coming weeks. The primary convective / divergence zone has persisted and enhanced over the central tropical Pacific, and should remain over the next couple months. This will support the development/persistence of the sub-tropical mid-level ridge and the Aleutian/Gulf of Alaskan trough extending equatorward, as is frequently the case in +PDO/Strong Nino Decembers. 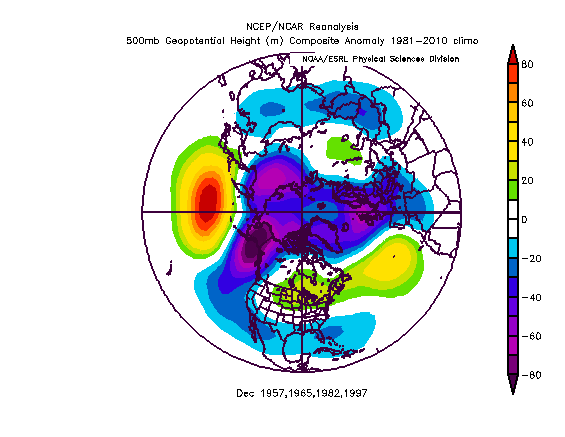 Below is the composite 500mb anomaly for neutral to positive PDO / Strong Nino Decembers. The unfavorable pattern for winter weather was anticipated for the month of December, and is not a surprise. The NAO / AO persist in their positive modalities, consistent w/ the climatological state of the stratospheric / tropospheric vortices in similar prior patterns. However, changes will begin to occur insofar as the initiation of more conducive troposphere-stratosphere coupling by the second week of December. In the near term, 100mb poleward eddy heat flux will show a spike in the next few days as the realization of the most recent wave 1/wave 2 flux occurs. This initial stratospheric perturbation will be followed by a sharp decrease in momentum/heat flux and consequently a maintenance of strong vortex conditions through December 5th. As one can see by the November 500mb composite, the North Pacific pattern was very unfavorable for amplification of planetary waves due to the presence of an Aleutian ridge. The Asian/Eurasion pattern was more conducive, though less than ideal, via the development of the northwestward-propagating Siberian high induced in part by the rapid snow advance. Overall, the composite northern hemispheric regime was sufficient to promote the current flux pulse, but largely insufficient insofar as creating persistent / strong wave driving pattern. If the model proggs going forward are at least somewhat accurate, it would appear that the December 500mb anomaly centers will be much different than November w/ the initiation of a more typical Aleutian low height anomaly. Expansive lower than normal heights are forecasted to develop in the central/north Pacific. Constructive interference via the emergence of impulses east of Siberia should reinforce the strong Aleutian low height anomaly. The JMA depicts this pattern quite well by week 2, and persisting through week 3/4, namely, the North Pacific low height anomaly, induced via tropical [ENSO related] and extra-tropical forcing mechanisms. The ECMWF/weeklies depict a similar Pacific evolution. In the eastern hemisphere, the JMA and Euro do suggest that heights will rise in eastern Europe and NW Asia, although the signal is much less pronounced/distinct than the Pacific pattern. Therefore, at least for the time being, it appears that the evolving December pattern (particularly after December 6th) will promote significantly enhanced wave 1 EP flux converging at the vortex. Typically, if the tropospheric pattern progresses in relative accordance with current projections, we would see a gradual, then sudden, increase in wave activity flux anomalies by late December. Depending upon the timing of the evolution of features in the troposphere, the stratospheric response could occur earlier or later than that. However, the totality of indicators still suggests that the tropospheric pattern will eventually become more conducive for high latitude blocking in January. As noted, based upon current proggs, I think the probability of a displacement event is higher than a vortex split, if a SSW were to occur. If it occurs, the timing is difficult to predict at this lead time, but I continue to favor a weakened vortex by early-mid January. In sum, the Nina-like extra-tropical pattern for November will transition into a classic strong Nino regime w/ an expansive, robust north Pacific low height anomaly. This, consequently (acting concurrently w/ the positive NAM) should promote a warm/very warm temperature pattern for the Northeast/Mid-west. Snowfall may occur in the interior Northeast. The second half of December offers increased odds for the coast via climatological progression, but the pattern overall should still be largely unfavorable. Transient cold-highs properly timed with STJ disturbances could produce some snow, but December on the whole does not appear to be a wintry month for I-95 [this is in accordance with expectations]. The development of certain tropospheric features by week 2 should increase the amplification of planetary Rossby waves such that WAF gradually elevates, with the substantial spike(s) realizing its effects in the stratosphere by late December/beginning of January. The stratospheric vortex and/or the tropospheric vortex still look on track to weaken in January. In the near to medium term, both vorticies will remain very strong. I would not expect any SSW to be detected on models for at least 3-4 weeks. Thus, I would continue to favor a 58/41/66/87 analog track as far as the NAO/AO progression rather than 83/98. We will see how it goes. Should be interesting to see how the winter progresses with the strongest basin wide Nino on record in progress.